At first it looked like a dud to me but after watching a few reviews and replays I think I might get it mostly because I actually have a decent coupon that will apply to it(I hope) whenever they decide to actually sell it. It seems to me to be a tier 8 Leo which is a tank I REALLY don't like BUT the one thing I dislike the most about it is it's horribly unreliable gun and apparently that isn't a problem with the Lansen. I only played 1 game to settle my crew into it, but it looks like fun. Definitely more sprightly that I expected. It's perhaps a little beyond my skill level but I figure my primary use of it in the next few months will be using it to train my Swedish crew in Frontlines as I recently decided to go up the Swedish medium/heavy line. I bought it yesterday because I wanted a tier 8 crew trainer for my Swedish medium crew. I already have the Strv m/42-57 but it’s only 3 men crew so it’s not good for the four men crews needed for swedish medium, nor is it the same playstyle. I didn’t have expectations of it being OP, I don’t need OP, what I want is a tank that has the same playstyle as the tank I am training for. I would have liked if it had the siege mode but okey you cant get it all. After 4-5 games I can say I like it. The tank is quick and can easily relocate, I love that. The gun handling stats are poor but honestly it feels more accurate than the 0.38 the stats say. And the alpha is great, it’s actually really easy to get over 2k damage and that means cashing. Too few games I know, but the first impressions are all positives. I suspect the tank might not be too bad, because I find the current T8 1-shot mediums to just be too slow and not do enough damage to have consistent games. 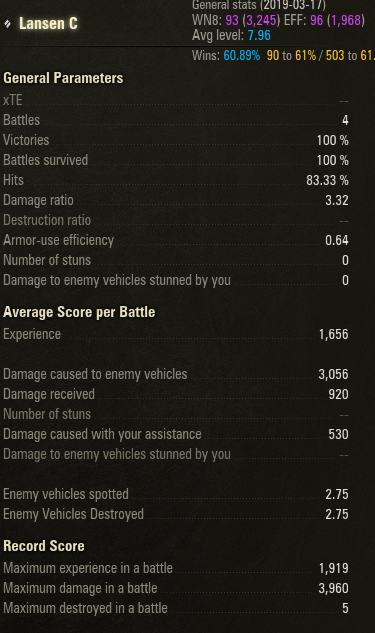 So, this tank apparently being slightly more springy and doing more damage might, in fact, make the tank perform well enough since I can't stand the other T8 mediums (save the Italians) which are able to compensate due to their auto-loaders. I can't change your mind it's not worth it.1 it's tier VIII 2 it's a swedish tier viii to train crews for tanks that probably won't be that good.Fyi perfectly balanced means average to bad with a high skill cap tank.Dont buy it or sell it if you did. Only played 1 game in it but I'm happy with it since I was pretty apprehensive about it. Very mobile, not the fastest top end but gets there quick and has good ground resists, feels more like a light tank. DPM is excellent, significantly better than most other T8 meds. I think the Panther 88 is tied with it and the 416 is the only one that surpasses it(by a a huge margin). The lowish pen will negatively effect this, would be best to choose your targets wisely to make the best of it. Good gun depression and OK elevation. Gun works very well at close to medium ranges. High ammo capacity which I like these days since I can carry more HE without too much of a handicap. 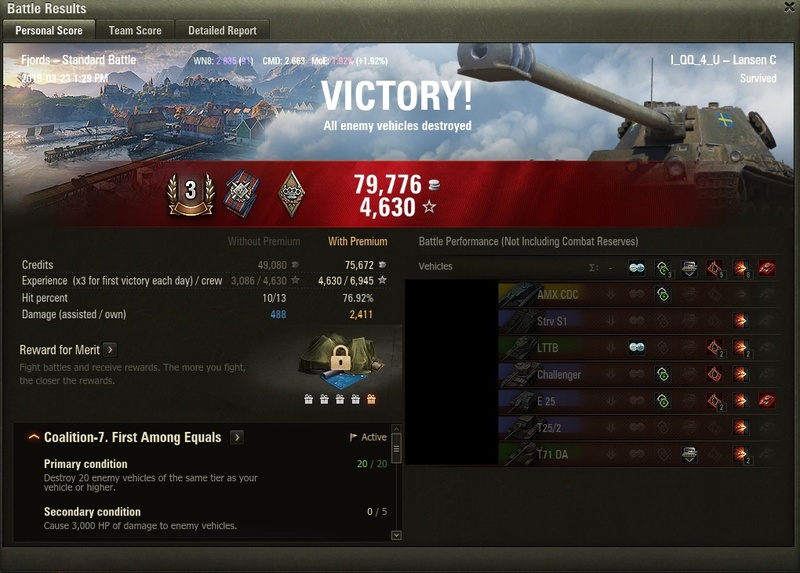 Camo seems quite good, 34.24 stat/26.43 OTM with paint, BIA and one crewman with 77% camo. Pen not great but workable. Lowish VR for a medium but you can get it to 450 with optics if you have all the VR skills. Reload is a tad long but offset by the high alpha. Aim time is a bit long though not as much of an issue at closer ranges. Slow turret traverse although I didn't notice it so much but with a meh hull traverse you might have issues with circling AC's and fast lights, might be best to try and ram them in that situation if you can since you have the agility and acceleration to do so. Shell velocity, regular AP is about average but is going to hurt it's seemingly bad sniping performance. Most of the worse ones are Russian or Chinese and can afford to get in closer to the action. As a trainer there's one redundant crewman for new mediums. Not really an issue in my books. Armour, do not expect a lot of bounces. Long range sniping, only fired 3 shots over 300m, all at stationary targets, but all went hilariously off course, might be an outlier? High shell cost but offset by high alpha, pen your shots and it will pay off. High fire chance, 20%. With no armour to speak of this could be a big problem. No food for you? No idea what to expect with modules, I got penned three times but didn't lose anything. It does seem to be like a T8 Leo with better mobility and gun, the latter of which really made me hate the Leo. This tank is my new love right now. That 320 alpha packs a punch, hitting that hard compared to all the other t8 meds is something else. Like QQ mentioned, having the huge ammo capacity allows for a wide assortment of shells. The depression is huge for me as well its reverse speed for that almost instant pullback. I've been peaking people like crazy on hills. I also had 4 female crew members in the barracks, so rocking a full female BIA crew in it. A very small sample size and I won't be able to maintain these stats, but so far I've been top tier twice and t10 games twice, and it performed well in both matches. Edited by Blazzy, Mar 24 2019 - 03:29. I seem to have completely missed whatever your point is. ​Your most played vehicle is the M55/M53 and you're going around mocking people for rerolling. It's a balanced tier 8 premium, so yes it's not worth it. Better to wait until WG releases another OP premium instead. But my 30% discount coupon expires tomorrow. The base tank (w/ 100% crew) in the Premium Shop is $34.99 US. My coupon drops that to $24.49 US. Does that affect your analysis? My only Tier VIII Premium atm is the Super Pershing. 1. Is it a decent credit earner? I could certainly use one. 2. Is it a viable tank for Frontline mode? It's been my limited experience with FL that some (read very few) Tier VIII tanks are suitable and others (read most of them) should just be left in the garage. Edited by zhimbo2018, Mar 24 2019 - 18:53. I don't own one but from what I have seen this tank is just a middle of the pack tier 8. Great players will be able to use it effectively but at the end of the day there are plenty of tier 8 prems that are better. And I wouldn't sweat the 30% off coupon expiring, they give those out like every week. What a waste to have to read through your meaningless comments. "Great players will be able to use it effectively". When is this not true? Why waste the space? Because I have seen people share replays where MAHOU players are dominating in this tank and use that as proof that the tank is great. I just wanted to specify to those that may be misled by that, the tank looks amazing in the replay because it is being played by an amazing player. The point is that if you are planning to spend money on a tank there are plenty of better options out there as far as premium 8s go. No, I'm not sure how saying "Oh no not Lisa's stats" means I have "illusory superiority". Doesn't really make any sense, it would have made more sense had you quoted an earlier comment of mine, but whatever. You do you. Have run into a bunch of them lately, and they seem to hit fairly hard and fairly reliably, but there a ton of other premiums that do the same. Seems to be nothing special unless you want a premium Swedish crew trainer. Let's see... There's the M4 Rev, but it's slow with bad DPM. There's the STG and T-34-3, but they're also slow with bad DPM, except they also don't have -10 degrees. There's the Lorraine, but it's an autoloader with a long load. What other premium is there that doesn't have the 230/240/250 alpha damage, and still has good DPM, is quick, and has good gun depression? Seems like a pretty unique and special premium vehicle to me.